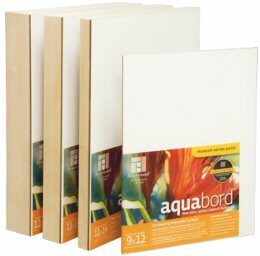 Aquaboard is an acid-free textured clay surface that absorbs watercolors like a fine paper. The boards excel in retaining the purity and vibrancy of watercolours. The surface provides natural looking highlights, fluid glazes, transparent subtle layers, and the ability to lift color while the surface is wet or even after it is dry. The boards will not tear, shrink or buckle even under heavy water application. Archival, eco-friendly and made in the USA. Of particular note is that finished artworks do not need to be placed under glass. Simply seal your painting with several layers of a non-yellowing clear spray varnish. Before using the Aquaboards simply wet them with a large wash brush and water to flush out any air trapped in the surface. Once the board is damp it is ready to use. Four different sized Aquaboards are currently available. They all have a 1/8 inch depth (first board pictured below).